Uncategorized | It's a MicrobeFul World! Remember the carotenoids? These antioxidants that also let golden staphylococci resist phagocytosis (1)? A recent study in Science Magazine (2) demonstrates, for the first time, the ability of animals (insects: the pea aphids that infect peas and other plants) to synthesize carotenoids. Well, they didn’t exactly inherit it vertically from their ancestors, but rather got the genes as a kind gift from some fungus, long long time ago. 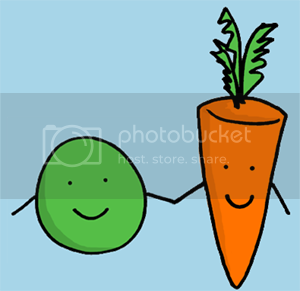 I will let you read the study, and uncover the new convoluted link between peas and carrots: Carrots —make–> carotenoids —also synthesized by–> fungi —horizontally transferred to–> pea aphids—infect–> peas (it’s still below six degrees of separation)! Welcome to “Learning Microbiology and Immunology,” a pilot weblog for all learners in the fields of Microbiology, Immunology, Infectious Diseases, Microbial Genetics, Microbial Genomics, and more.